Galvanic skin response measures the activity of the sweat glands, which are located over all our body in different proportions. The GSR electrodes need to be in contact with the skin to measure GSR. It is important that the GSR electrodes are located in an area of the skin that contains enough sweat glands to obtain a good GSR signal quality. Our body has two types of sweat glands distributed throughout our skin: apocrine and eccrine glands. The eccrine glands reflect the emotional activity and can be found almost everywhere in the body in different proportions. Palms, feet, fingers and shoulders are the most common locations to place the GSR electrodes because they have a high density of sweat glands. The appropriate location of the electrodes will depend on the experiment setup, the type of electrodes available and the level intrusiveness that your participants will allow (e.g., dry electrodes on fingers are less intrusive than wet electrodes on one foot). Once you decide the most appropriate place to locate the GSR electrodes for your experiment, it is important to keep the same location and type of electrodes for all your participants to obtain comparable results. the hand with electrodes will not be used. Foot High Pre-gelled disposable and wet/dry reusable High Stationary studies where both hands will be used. Stationary/mobile studies where both hands will be used. Palms have the highest density of eccrine sweat glands and therefore they are the preferred place to attach the GSR electrodes. Fingers usually give a lower GSR signal than palms, but most of the times are a suitable place to attach the electrodes. In general, as long as the GSR signal is above 1µS, finger electrodes can be used with good results. 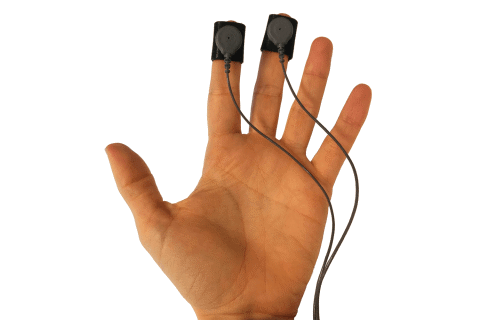 It is common to use the non-dominant hand to attach electrodes because the participant is less likely to move it during the recording. This will avoid creating artefacts in the GSR signal. This is particularly important when the participant needs to use the dominant hand to, for example, press keys on the keyboard or click mouse buttons. 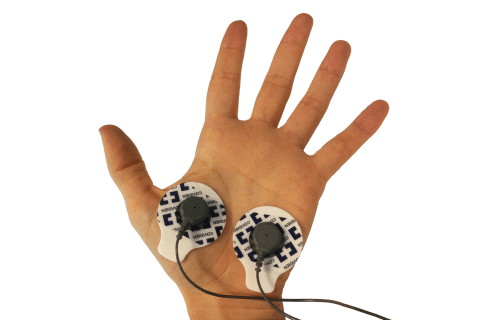 Palm electrodes are usually attached to the skin using an adhesive collar around them. The electrodes should be placed on the lower part of the palm, with enough space between the electrodes to avoid contact. Finger electrodes are usually wrapped with Velcro® or taped around two fingers. The electrode surface should be placed against the inside part of the finger. The distal phalange has more density of sweat glands, although the intermediate phalange is also a common place used to attach the electrodes because it is less likely that they will fall off the finger. 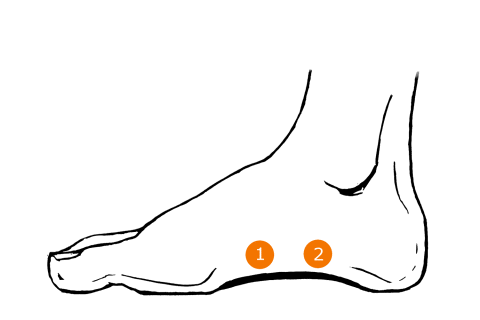 The inner part of the feet is also a good place to measure GSR because of its rich concentration of eccrine sweat glands. This is especially recommended when the participant needs to use both hands during the recording. 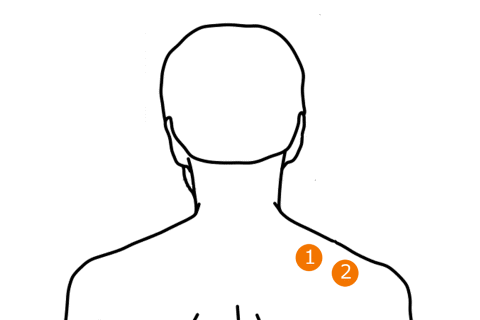 The shoulder, although with less density of sweat glands, can also be a good alternative to hands and feet when the participant needs to use them during the recording (e.g. walk around a store and use the hands to grab products).